METHACRYLATE AND ACRYLATE ALLERGY IN DENTAL STUDENTS. Maya Lyapina 1 , Assya Krasteva2, Maria Dencheva2, Mariana Tzekova2, Angelina Kisselova-Yaneva2. 2) Department of Oral Imaging and Oral Diagnostic, Faculty of Dental Medicine, Medical University Sofia, Bulgaria. The purpose of the study is to evaluate the incidence of contact sensitization to some (meth) acrylates in students of dental medicine at the time of their education, in dental professionals (dentists, nurses and attendants) and in patients, the manifestation of co-reactivity. 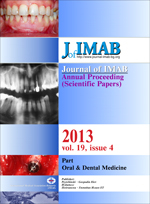 A total of 139 participants were included in the study, divided into four groups: occupationally exposed to (meth)acrylates and acrylic monomers dental professionals, 3-4 year-of-education students of dental medicine, 6th year–of-education students of dental medicine and patients with suspected or established sensitization to acrylates, without occupational exposure. All of them were patch-tested with methyl methacrylate (MMA), triethyleneglycol dimethacrylate (TREGDMA), ethyleneglycol dimethacrylate (EGDMA), 2,2-bis[4-(2-hydroxy-3-methacryloxypropoxy) phenyl]propane (bis-GMA), 2-hydroxyethyl methacrylate (2-HEMA), and tetrahidrofurfuril metacrylate. The overall sensitization rates to methacrylates in the studied population are comparative high – from 25.9% for MMA to 31.7% for TREGDMA. Significantly higher incidence of sensitization in the group of 3-4 course students compared to the one in the group of dental professionals for MMA and TREGDMA was observed. Highest was the incidence of sensitization to ethyleneglycol dimethacrylate, BIS-GMA, 2-HEMA and tetrahydrofurfuryl methacrylate in the group of patients, with statistical significance comparing them to the group of dental professionals. More intensive risk management training programs in exposure to methacrylates and use of proper personal protection among students is recommended. Key words: methaclrylates, sensitization, occupational exposure, dental students, skin patch-testing. Lyapina M, Krasteva A, Dencheva M, Tzekova M, Kisselova-Yaneva A. Methacrylate and acrylate allergy in dental students. J of IMAB. 2013; 19(4):363-370. doi: 10.5272/jimab.2013194.363. 5. Björkner B. Plastic Materials. In: Rycroft RJG., Menne T, Frosch PJ, Bernezra C, eds. Textbook of Contact Dermatitis. 2nd ed. Springer Verlag, Berlin, Heidelberg, New York, 1995, 539 - 550. 25. Wallenhammar LM, Ortengren U, Andreasson H, Barregård L, Björkner B, Karlsson S, et al. Contact allergy and hand eczema in Swedish dentists. Contact Dermatitis. 2000 Oct;43(4):192-9. [PubMed] [CrossRef].